What happened to Brian De Palma after he blew up John Cassavetes to conclude THE FURY? He realized that, for now, he had reached the end of the line on bloody expensive melodramas. It was time for a genre and budgetary change, and also a switch in scenery. Very quietly, De Palma holed up at Sarah Lawrence College in Bronxville, New York, and wrote, directed and supervised a surprise independent feature, HOME MOVIES. This goofy character comedy with a filmmaker-on-filmmaking subtext was shot on campus and utilized the talents of the hard-working students from a filmmaking course De Palma taught winter-spring semester, '77-'78. HOME MOVIES is being edited at this moment. Negotiations are in progress for an early 1979 release. 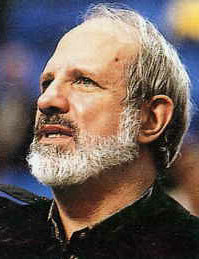 De Palma attended the Montreal World Film Festival in September as Guest of the Festival, and he recalled with amusement how just a few years ago he had to sneak into the MIDNIGHT COWBOY party at Berlin. He was an unknown then, showing off GREETINGS, prior to the Hollywood commercial successes of OBSESSION, CARRIE and THE FURY, and to the additional cult status of HI, MOM!, SISTERS and PHANTOM OF THE PARADISE. I talked to De Palma for several interesting hours in his Montreal hotel suite. For the first time, he broke his vow of silence on HOME MOVIES and offered Take One a candid, exclusive look at how his important new independent movie was made. PEARY: Why did you decide to make HOME MOVIES outside of Hollywood? BDP: I've been sort of traveling around the country for ten years talking about independent features. And whenever I asked who the new independent filmmakers were, everybody gave blank stares. I thought if I showed how it could be done, maybe I could start off new directors. I'll never forget Terry Malick saying that my touring with GREETINGS had inspired him to be a director. GREETINGS was financed by friends and relatives of the producer. We had only about $20,000 in cash, $23,000 in deferred payments. HI, MOM! was financed by a small company called Sigma Three for about $100,000. I set out to make a feature in 1978 along these lines. GP: How did you settle on Sarah Lawrence College as your base of operation? BDP: When I was at Columbia, I wasn't getting much support from the university. But acting in plays, I got to know Wilfred Leach very well; and he helped me get this fellowship to Sarah Lawrence. I had a graduate fellowship in the theatre department from 1962 to 1964. It was a great place for me to get started, so I felt very close to the school. I always wanted to do something to pay back the help. Also, I knew they had the flexibility to authorize my project after just a few phone calls. Last November, when I was editing THE FURY, I called Wilfred and said I'd really like to teach a course in low-budget filmmaking. And for the course we would make a low-budget film. GP: How was it inaugurated? BDP: The course was Independent Filmmaking. We got students together for our first meeting last December 20th. There was a blizzard in New York and they came through this blizzard to a meeting. There was no transportation. There was ten inches of snow on the ground. You had to get there in your snowshoes. I said to myself, "These are tough kids." We had undergraduates to graduate students, ages 18 to 26. I had this story I had written long ago that I always wanted to do. So we had a discussion about the script and budgets and then we broke up into production people and script people for three or four months. The production people worked on making a board, making a budget, and the script people started writing scenes based on my story. Then we'd have weekly meetings, like student council meetings, and run down all the areas: who would be doing what about what, and how were we going to get financed, and all kinds of schemes. GP: So what was your budget? BDP: The budget kept rising. It started at $50,000, then it went up to $150,000. It kept going up. But I can't really discuss numbers for the simple reason that when we sell the film, we'll be hanged by the figure. A distributor can say, "It costs so much. I read it here." Let's say it cost under one million dollars. GP: It hasn't been purchased yet? BDP: No. We have all kinds of financial schemes going on. Majors want us, independents, but we are just going to see what would work. I had the students checking all the schemes because that's what happens when you're financing a movie. You send it to studios. You go out to lunch with tax shelter lawyers. It's all part of the course. Actually we had to turn away a lot of money. At first people within the industry didn't take it too seriously. But then we got some very prestigious people to ultimately invest in the movie, so Hollywood got interested. I was one of the largest investors, and I brought people in with me. Jack Temchin and Gil Adler, who had produced the play El grande de Coca-Cola, came in. They raised half the money and we were like executive producers. GP: What were the rules of the game about involving your name? BDP: I tried to use my name as little as possible because I thought it would affect working conditions. If the students were doing their own movie, they wouldn't have that kind of clout. When we finally got a script together, we put ads in Show Business and Backstage and had casting calls. We saw hundreds and hundreds of actors off the street, and we didn't use my name in advertising. But as casting went on, I got into trouble. I needed professional help. A young casting director, Scott Rudin, called up and offered to help us. He brought in some really good actors, and we finally cast his discovery, Keith Gordon, as the young boy lead in HOME MOVIES. Keith is also in JAWS II. Then Kirk Douglas called up and said, "Maybe I can help you out." I sent the script to him and he wanted to play a part. Our people were all excited: Kirk Douglas in our first picture! Then I used some actors from my other films, like Nancy Allen from CARRIE and Gerrit Graham who had done GREETINGS, HI, MOM! and PHANTOM OF THE PARADISE, Vincent Gardenia came to me through Jack Temchin, and Mary Davenport from SISTERS. And that sort of made up the cast. GP: And the production staff? BDP: One kid had assisted me on a couple of films, and had done gaffing on low-budget productions, and wanted to be a cameraman. I made him director of photography. He brought some kids with him from California and the group lived in the dorms at Sarah Lawrence. One kid who had been following me around Chicago became an assistant director. One writer became my assistant, another became a grip, another became head of costumes, another head of casting. A kid from North Carolina who had brought me out to talk to his cinema class became one of the student producers. All the kid producers were unbelievable. They were just running everything, making deals, heading the production company, handling the money. Art direction was very good. This kid dressed the set and came up with really good ideas. What happened was an educational experience. The sort of openness and democratic beginning evolved into a real professional shooting unit. A kind of pecking order of authority figures emerged in order to get things done efficiently. GP: What about the direction of HOME MOVIES? BDP: I tried to let the students direct and write as much as possibly could be done. The irony of it was that we got involved in hundreds of thousands of dollars. It was money which outlined our creative parameters and our flexibility. I had to step in and make sure it all worked. It's so important to make this film a success. Otherwise this kind of film will never be done again. GP: How much was directed by others? BDP: Some shots, a couple of small scenes. About one twentieth was directed by the kids. I wouldn't be surprised if you couldn't tell what was not directed by me. Each week there were new student directors. I would assign them if I felt they could handle what was to be done. The biggest problem was that the actors were professionals and felt uneasy with student directors. GP: Did you have a second unit? BDP: I planned a second unit running all the time, directed totally by the kids. But we couldn't possibly do it. We just didn't have the personnel. We needed all our people right where they were. GP: Were there students who dropped the course or were angry because HOME MOVIES didn't work the way it had been planned? BDP: I don't think we lost one student. We kept picking up students. I do think some were disappointed that they didn't have more creative flexibility; and I was disappointed that I couldn't allow it to happen. But they worked incessantly and a lot of them got very sick while we were shooting. We lost them for a week or so. There was one kid who was very ill and we couldn't stop him from working. He was one of our best student electricians. I don't think anyone realized in advance the intensity of it, 12 to 18 hours a day, six days a week. I mean, I hadn't worked that hard in a long time. GP: Did your crew also act in the film? BDP: They appear as extras throughout the movie, and are students in the classroom scene. Only two of the crew were actors. The others weren't much interested. The just did parts because we needed people who'd be around all the time to carry through the shots. They'd step out of their departments, put on costumes and play their parts, and then go back to their departments again. GP: How did everyone get paid? BDP: Everybody was working basically for nothing, $50 a day, but everybody got a percentage of the profits, doled out in points. BDP: When we talked about Kirk Douglas, I told the students, "Kirk will do this and this for us. It's nice of him to do it, but I don't really know if we can afford him." They said, "No, no, please use Kirk Douglas." I agreed. "It's important. Kirk is a major movie star; and when we sell the picture to television or to Europe, it means something, a student film with Kirk Douglas in it." In terms of profits, we had to realign them. Kirk came in as an investor. We knocked out a lot of the kids' investors. I said, "Well, Kirk here wants to put his money in the movie. What are you going to do? Are you going to take Kirk's money? How about your father's money?" Again, I let them make all the decisions. I'd advise them, but they decided what they wanted to do. GP: What is the plot of HOME MOVIES? BDP: The story is about a young kid, Denis Byrd, whose older brother, James, teaches a course in Spartanetics, a wilderness type of course. Denis has a love affair with James' fiancee and gathers divorce evidence on his father, Doctor Byrd, by following him around at night taking pictures of his various rendezvous with a Swedish nurse. The whole movie is kind of bracketed by Kirk, who plays the "maestro," a character teaching a seminar in Star Therapy. That's an "estian" philosophy where people must learn to star in their own lives. They mustn't be extras, they must put their name above the title. If they want a studio car, they get a studio car! Kirk was there for four days, and his scenes were mostly with Keith Gordon, the young boy playing Denis. He finds Denis spying on his father, tells him he's nothing but an extra in his own life, hiding behind trees spying with his binoculars. Kirk gives him a camera and says, "You must shoot YOUR life. You must make YOURSELF a star." In Denis' film diary, he becomes an important figure, a major star in his own life. All of Kirk's stuff is shot cinema verite, and his own Star Therapy is to have cameras running on him all the time. He's constantly directing the camera crew that's shooting him, telling them to come around for closeups, over here for a medium shot. When the lab saw the stuff, they thought Kirk was directing the movie. Like in HI, MOM!, there are three different film forms in HOME MOVIES. There's the Star Therapy form, which is making the viewer conscious of the film as it is shot. You see the mike and the lights. Kirk talks to the cameraman -- giving him directions. Then there's Denis' diary, which is as if you had an 8mm camera and were talking into it. Then there is the body of the film, which is sort of like HI, MOM!, with the character falling in love with the girl and their affair developing throughout the movie. Denis' diary film evolves into what Kirk's film is, and Denis' conclusion is sort of the ultimate dramatic conclusion of the film itself. I mean all the films come together in one big resolution, when he finally gets the girl and takes over his own life. GP: Is this film based on your personal experiences? BDP: Well, there are a lot of autobiographical things. The Byrds are somewhat reminiscent of my own family, the brother, the parents. I've never done an autobiographical movie before, but this is a very, very zany look at the family. GP: What was the fanciest shot you tried? BDP: We have a 6 1/2 minute tracking shot. It took us a day to do, and we stopped at Take 28 or something. But I was amazed that we pulled it off. It's a scene where the girl comes to the family's house and she walks from room to room, running into one member of the family after another. The dialogue had to whip along, everybody had to be in the right place as the camera moved around, hitting these marks. It wasn't the greatest tracking shot in the world, but it played. I have a very good shot of James lecturing Spartanetics theories to his students by a fire in the woods. That's done in one long shot with very funny material there. I just have a few cutaways to break it up, in case I want to go from one take to another. GP: You have said you learn something specific and pragmatic with each film. What about HOME MOVIES? BDP: I hadn't done just a straight-out comedy in a long time, just letting an ensemble do really good character acting, having them carry the movie as in my earlier pictures. I like the kind of mad story of this lunatic family, something I haven't ever done before. HI, MOM! and PHANTOM OF THE PARADISE are the most idiosyncratic of my movies and this one, too, is very idiosyncratic. But I think we made a fabulously funny movie. I think HOME MOVIES will be very successful. And I think it might start a new generation of low-budget filmmakers. GP: Can you compare the experience of making HOME MOVIES with university training in filmmaking? BDP: I did take a one semester course at NYU in production, but that was the only real film school experience I had. The biggest mistake in student films is that they are usually cast so badly, with friends and people the directors know. Actually you can cover a lot of bad direction with good acting. The real trouble with film school is that the people teaching are so far out of the industry that they don't give the students an idea of what's happening. Students should be exposed to the best people in the profession. If you study surgery, you study with the best doctors working in the hospital. You don't study with the ones who couldn't get a job.